Yola English – Junior (YEJ) is an English language program for students in grade 5 to 9, applying a completely new method to teaching in Vietnam: learning English through Science and Social Studies; incorporating life skills under the American program, so-called Content-Based Instruction. Junior English (YEJ) programs at YOLA are intended to help students build confidence and proactive attitude in the use of English to communicate, as well as reinforce their critical thinking and exploration of new knowledge. 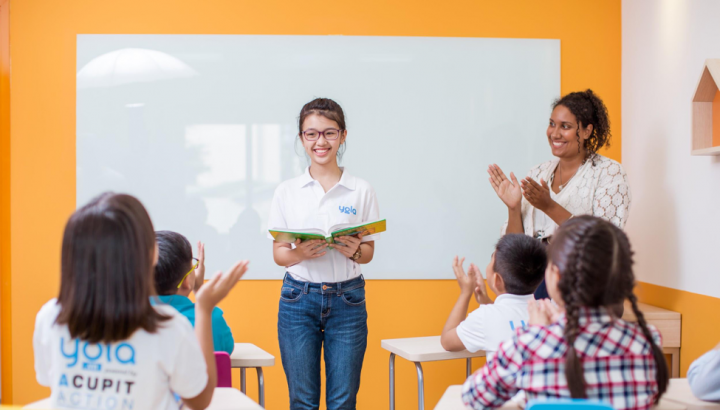 Besides highly experienced native teachers, Vietnamese teachers, they are former students who have experienced in living, studying and working in the US, UK and Australia. They will encourage students to think creatively, increase class interaction and arouse passion, hidden power within the learners. Learning English through Science and Society combines soft skills to help students use English as a tool to develop four essential skills: active listening, confidence speaking, critical thinking. and creative writing as well as learning skills and increasing language applicability in different areas.